According to the Melbourne International Film Festival, China has been angered by the fact that the festival is showing a documentary about Rebiya Kadeer and that she has been invited as a guest. (The Chinese don't like her because she's a leading Uighur.) That they are angry is one thing, but that they are actively trying to stop the event is quite something else. The festival's website has been attacked by hackers, and the Chinese contacted the festival, urging them not to invite Kadeer or show the film. The festival didn't budge though. This is obviously not the way to behave if you want to be regarded as a benevolent world power. The hacking of the festival's website is bad enough but that could have been the work of ordinary punks. But that Chinese officials are trying to decide which films the festival may or may not show is just plain wrong, and rather disturbing. As of now I've seen all of Ang Lee's films premiered so far! Today I've seen Pushing Hands (1992), his first, and my last. No, latest. It was not his best but good enough. The dialogue was over explanatory, which is always annoying, but anyway. It was about families and the difficulties of communicating, done with calm and restraint. No surprises there. But here's a scene from a better film. His version of Sense and Sensibility (1995). 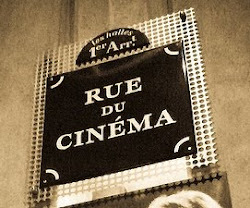 There's something special about the French cinema of the 1950s, before la nouvelle vague, when an austere, clean style was popular, most famously in the films of Robert Bresson and Jean-Pierre Melville. It's also very apparent in Le trou (1960), directed by Jacques Becker, and based on a true story about an attempt to break out of La Santé prison in 1947. It's similar in style and look to Bresson's A Man Escaped (Un condamné à mort s'est échappé 1956), which is also based on a true story. Le trou is little over two hours, has no music and little dialogue. The actors are all amateurs, some even prisoners, and most of the film takes place in a cell shared by five men. There are just two scenes outside of the prison. But the tension and the atmosphere are remarkable. It's almost a zenlike experience to watch it. The quiet desperation of it all. It's a beautiful film. I haven't seen enough of Becker's films to talk about his work with nothing more than generalizations, but of those I've seen Le trou is by far the best. And now I want to see Casque d'or (1952) again. I had long wanted to do an Ingmar Bergman festival in Georgia, and it was of course very fulfilling that not only did it happen but that it was such a wonderful success. All screenings were sold out and the response was excellent. I had chosen five films, Summer Interlude (Sommarlek 1951), Sawdust and Tinsel (Gycklarnas afton 1953), The Magician (Ansiktet 1958), Persona (1966) and The Autumn Sonata (Höstsonaten 1978), based on the theme "Portraits of Performers", to give a broad and varied overview of Bergman's work. The first two are my personal favourites among Bergman's films. Summer Interlude is seldom seen, and hardly known at all, and I was somewhat nervous of how it would be regarded. But the comments I heard put a shame to my fears. They thought it was very good, very moving, and they wondered why they had never heard of it before. A valid question. During the years I've been working in the world of Bergman, I've always tried to push forward the lesser known films, Some of them are among his best and it's somewhat boring that it's always all about Wild Strawberries (Smultronstället 1957), The Seventh Seal (Det sjunde inseglet 1957) and Fanny and Alexander (Fanny och Alexander 1982), no matter how good they all are. Speaking of unknowns, yesterday I for the first time saw his early film Music in Darkness (Musik i mörker 1948), Rather terrible, but with one or two good scenes. Mai Zetterling is the best thing about it and a hallucination sequence in the beginning which wouldn't have looked out of place in a film by Michael Powell. I just learned that Karl Malden has passed away, 97 years old. He was one of my favourite actors, from The Gunfighter (1950) to a guest appearance in an episode of The West Wing. I'm at a Bergman festival in Tbilisi, Georgia, for the moment and can't blog all that much. But when I'm back home, I can and I will.